Home » News » Who is Thanos in Avengers? Who is Thanos in Avengers? 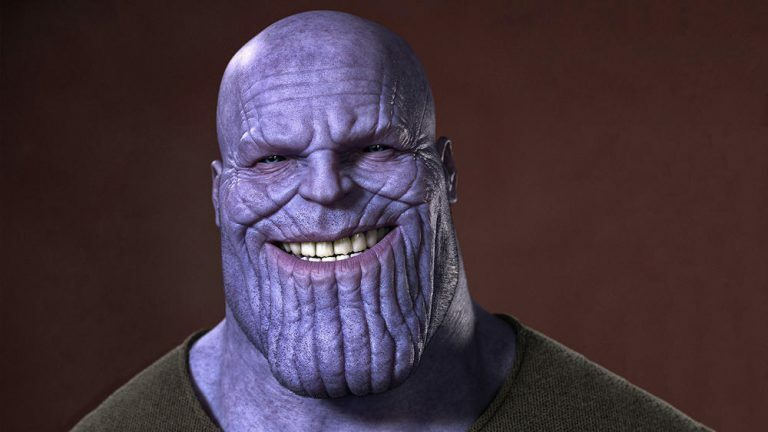 Thanos – this powerful adversary of the Avengers had his first appearance during after credit scene of the first Avengers movie. Upcoming premiere of the Avengers: Infinity War is going to let us get to know one of the most powerful villains a bit better. Who is Thanos in Avengers? MCU is quite noticeably different than its comic equivalent. On one hand, it’s understandable that some aspects need to be adjusted to modern day fans, but on the other, some of them may be impossible to tweak like that and may not make much sense. That’s why the cinematic and comic universes are different. Thanos’ story and motivation have been changed in the movies. But we know one thing for sure – it’s definitely worth to know both versions to judge his influence on each universe. In the MCU Thanos is the strongest adversary so far. He’s a powerful Titan, an Ethernal, who’s obsessed with balance. His primary objective is to annihilate half of life in the universe. Thanks to the Infinity Gauntlet and Infinity Stones, that he manages to get one by one, he becomes nearly impossible for Avengers to defeat. He was born in our galaxy, on Saturn’s moon – Titan, from a race of superhumans known as Etherals. The mighty and durable Mentor is his father, Sui-San is the mother. Thanos was born an outcast. Due to his deformation, he did not resemble others of his race, he was also bigger than other kids. All of this probably activated his Deviant gene responsible for aggression. His own mother was so terrified during labor, that she wanted to kill him believing that Thanos could destroy the entire universe. She was stopped by the father though. The kid was an outcast and pacifist. He spent most of the time with his brother. When young Thanos noticed that his mother despises him, he started to get more nihilistic. His fascination with death made him meet the impersonation of death herself – Lady Death. He was lovestruck and decided to conquer the universe for her. He started showing his murderous instinct as a kid, torturing animals and getting his own mother into a coma. After a failed attempt to abolish his father and brother, he was banished and disappear for over a hundred years. He came back with a group of hostile races loyal to him to destroy Titan. During his travels, he focused on getting to know the power of Cosmic Cube he owned. When Adam Warlock told him about the mystical Infinity Stones, Thanos started studying ancient books to learn more about them, their origin and current location. Owning an Infinity Gauntlet, that was for him something like Arc of the Covenant was for Indiana Jones, he couldn’t stop until all that power was his. The ability to shape the universe according to his will would probably, knowing his instincts and motivations, result in the end of the world, along with the Avengers. I won’t get into too much details about his death – you can find them in a different article – Thanos Death Who defeated Thanos? I hope that you learned something new about Mad Titan Thanos. If Avengers-related stuff is your cup of tea, take a look at our Avengers category. Avengers Quiz – What do you know about Thanos? Who has created Infinity Gauntlet in comics? Why Thanos has purple skin? Why Thanos wanted to kill half of the cinematic universe ? Who was comic creator of Thanos? Based on what character Thanos was created? Who has killed Thanos in comics universe? [Avengers] What do you know about Thanos?